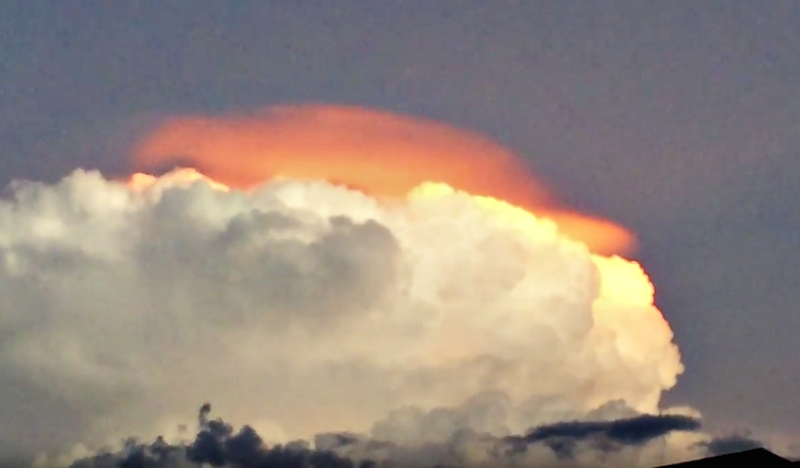 UFO SIGHTINGS DAILY: Flaming Orange UFO Hiding In Cloud, Causes Lightning On Aug 31, 2015, Video, UFO Sighting News. Flaming Orange UFO Hiding In Cloud, Causes Lightning On Aug 31, 2015, Video, UFO Sighting News. This is a great example of a giant UFO (orange) caught during sunset and its making the white cloud below it to hide over. At the 45 second mark a small aircraft exits the lower part of the cloud on the left side of the screen. It has plane lights on, but it could also be a small UFO. I doubt that a pilot would fly into a cloud like this on purpose. A crazy looking cloud appeared in the sky near Phoenix, Arizona on August 31st displaying what looked like a glowing , fire orange gaseous haze above a large cloud giving it the appearance of being on fire. It was atmospheric optics at work courtesy of the sunset but it was definitely a "Kodak Moment"! However, I have never seen such a display, very unique (to me).